Despite the new interest in non-European cities in general as well as the urban agglomerations of Africa in particular – being based upon older research predominantly done by historians – papers which focus on cultural and imaginistic aspects concerning urbanisation in Africa are lacking. 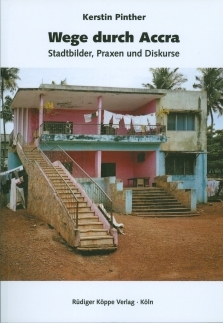 Located in the field of urban research relating cultural science, the present study applies here and analyses the interaction of urban appearance, forms of urbanisation and urban imagination, using the example of Accra, capital of Ghana as well as – in excursions – Kumasi, the country’s second largest city. In which discourses does or did urban experience articulate? Which symbols, icons and fantasies play a part in the urban imagination and which changes in the material sphere and the social practices do they relate to or which do they generate? The material this study is based on was collected during a twelve month-long research (2000–2001) in Ghana. Framed by a detailed introduction (Forschungsfeld Stadt) and an epilogue, this paper is addressed to this topic in three longer chapters. Chapter 1 deals with Stadtbild und Stadtimages. The material city, converted into stone, and its urbanistic, whereas in tendency socioeconomic groundwork, is under focus here. The (re)construction of the colonial, modernistic and postmodern city paves the way for portraying the present townscape as well as an understanding of the formation of both cities in excursions and retrospections. The following chapter considers the city in social categories and focuses on remarkable places and specific forms of urbanisation which have special relevance for urban experience and imagination. A field in which social and physical realities intertwine in particular is the public space. Corresponding to this, cinema, guarded housing complexes and the so-called kiosk culture as part of an increasingly competitive public are portrayed. The final chapter deals with the imaginative aspects of the city and urban life. In this respect, the integration of urban experience into literature, music, painting and movies is analysed, exploring urban icons as well as shapes of representational forms of the urban. In the epilogue, the conclusive discussion of the results having regard to the findings about other African cities takes place.